You might think that as you enter midlife, you have missed the opportunity to correct your vision. Well it might surprise you to know that there is not an upper limit for laser eye surgery and people in their 50s and 60s can enjoy all the benefits of vision correction just as much as someone in their 30s. As a general rule, patients over the age of 50 who are in good general health, free from eye disease and who have a stable prescription are fully suitable for vision correction surgery. There are a couple of considerations you should make, however. The risk of developing cataracts as you pass the age of 50 is greatly increased. Whilst this will not stop you from having laser eye surgery, it should be checked before you go ahead. Cataracts can change your vision, and can cause changes that disrupt your current prescription. This would undo all the good work your laser eye surgery has done, so get your eyes checked for cataracts before going ahead with anything. What sounds like a frightening, medical term is actually a completely normal condition which the majority of people will experience at some point once they pass the age of 40. Presbyopia is where your eyes have trouble focussing on near objects, and can often be characterised by the glasses wearer who takes their lenses off to read the paper. Laser eye surgery is fine if you want to correct long sight, short sight or astigmatism, but following treatment if you are over 50 because of presbyopia, reading glasses would be required. There is a laser procedure called monovision (blended vision) where one eye is corrected for distance vision and the other for reading and the brain adapts to allow you to see both distance and near. However, this will need a trial through the use of monovision spectacles or contact lens correction to confirm you are able to tolerate this. If you are aged over 50 and wish to eradicate the need for glasses or contact lenses to correct your vision then you will need to consider alternative treatments. 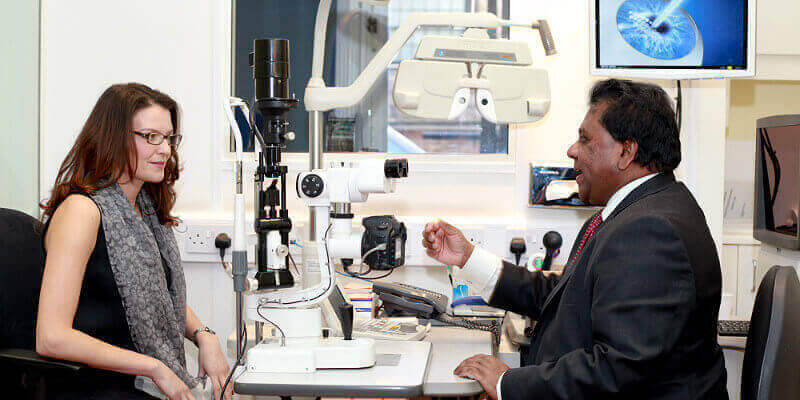 Here at Advanced Vision Care, we provide Lens Replacement treatment (also known as Refractive Lens Exchange) which is helping growing numbers of people over the age of 50 who will have developed presbyopia and in some cases early signs of cataract. This Lens Replacement procedure can be used to treat short-sight and long-sight as well as age-related presbyopia in the over 50s. Unlike laser eye surgery that alters the corneal shape, CLE corrects vision by removing the eye’s internal lens, replacing it with an artificial intraocular lens. These intraocular lenses can have a multi-focal component which means that the surgery can provide a patient with excellent distance vision and will also correct their near sight. Intraocular Lens Replacement is also predominantly useful for patients who have been diagnosed with cataracts, and for those patients who have no sign of cataracts, this treatment has the added benefit of eliminating their future development. If you are over 50 and would like to find out more about Laser Eye Surgery or Lens Replacement at Advanced Vision Care, then why not call AVC TODAY on 0800 652 4878 and request your free information pack or book your consultation to find out how we can help you.